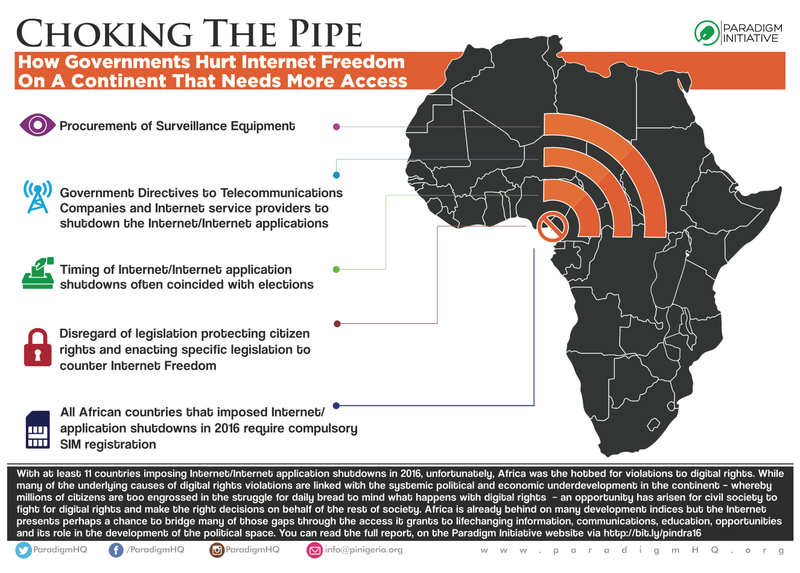 Digital rights concerns for Africa seem to be on the rise and so does the need to mount guard for its protection and respect across the region. Chief among these concerns is the wanton disregard for respect for human rights online by the state authorities. This has spurred many civil society actors to demand dialogues from governments and when this fails, seek legal redress on many of these issues. This is why Paradigm Initiative was in Court on June 28, 2017, to challenge the inaction of the Nigeria’s Ministry of Science and Technology towards the freedom of information request sent to it. The request was made to ascertain claims that the Ministry planned build and launch two satellites capable of snooping on the private details of citizens. The hearing has since been rescheduled for September 29, 2017. A few weeks from now, important national elections will be held in three demographically important African states. On August 4, Rwandans will be heading to the polls to elect a President. On August 8 and August 23 respectively, Kenyans and Angolans will also choose their President and Prime Minister in eagerly anticipated elections. Even though Kenya has recently committed to not shutting down the Internet for the upcoming elections, it has become more imperative not to lose guard of shutdowns incidents that are currently sweeping through the continent. One of such is the perennial case of Ethiopia. According to the Freedom on the Net report for 2016, the country is one of the two ranked as not free in terms of Internet freedom on the continent. This same antecedent was also duly reported in the Digital Rights Report for Africa 2016. This also follows in the heel of a recent Internet shutdown in the country on May 31, 2017, to prevent exam question leakages. While it is high time governments got more creative on better means of engaging malpractices during exams other than shutting down the Internet, civil society organisations can also step in to fill the gap constantly created by these excuses by coordinating with authorities on smarter ways that do not disrupt Internet activities in many of these countries. A Ugandan non-governmental organisation, Unwanted Witness has also joined 22 other international organisations to petition the Malian government on the recent Internet shutdown in the country. Many of these Internet violations occur regularly in these countries because they do not seem to be on the radar of many International human rights observers. This apathy could also be traced to why the reign of impunity is supreme other than the rule of law in many of these countries. Election time in Africa is usually accompanied by digital rights violations – notably Internet and Internet applications shutdowns. In 2016, five African countries – Chad, Gabon, Gambia, Uganda, and Zambia shut down the Internet/Internet applications during elections. Authorities in a sixth country, Ghana, threatened to shut down social media ahead of the December 2016 elections but were dissuaded from doing so partly because citizens made it clear it would have electoral consequences for the ruling party. Ahead of the elections, there is much to worry about as plans are already in place to stifle Internet freedom in these countries. In Rwanda, the government placed restrictions on the use of social media by presidential candidates, a decision which however has been recently reversed. In Angola, policies put in place in 2016 – plans to regulate social media announced by the President in his new year’s speech, and the creation of the “Angolan Social Communications Regulatory Body” to ensure compliance with new media laws, are threats to digital rights during the elections. In January, the Kenya Communications Agency warned it could shut down the Internet during the elections, and announced the purchase of surveillance equipment for social media and mobile phones. In March 2017, a court upheld the original court judgment to stop the installation of the mobile phone surveillance system and the last is yet to be heard of this development. An opportunity has arisen for civil society actors to rally African citizens to uphold digital rights. Evidence from Africa in 2016 showed that the best results in defence of digital rights were obtained when civil society worked with local actors to defend digital rights, rather than waiting for the international community’s intervention through organs such as the United Nations and the African Union. In any case, an intervention by the international community is made more effective by on-going local action by citizens. In Zimbabwe, despite government shutting down of Whatsapp during the #ZimShutDown2016 protests, citizens found other ways to mobilise to get their voices heard. In our quest to uphold digital rights during this election season, perhaps when we manage to find creative ways to mobilise citizens despite shutdowns like the Zimbabweans did in 2016, or when as seen in Ghana last year, citizens make it clear there will be electoral consequences for Internet shutdowns, real progress will be made.